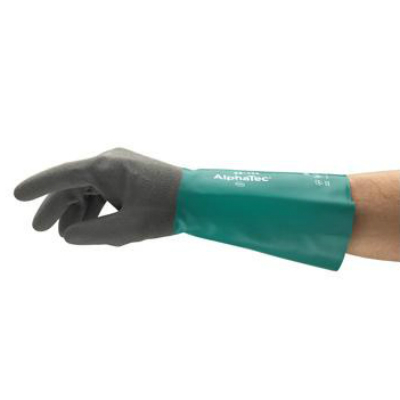 Constructed from a high-performance nitrile shell and cuff gutter, the medium-duty Ansell AlphaTec 58-435 Chemical-Resistant Gauntlet Gloves provide excellent protection against bases, oils, fuels, greases, animal fats and some solvents. Featuring Ansell Grip Technology, the AlphaTec 58-435 Gloves enable good control when handling oily or wet items, and require less force when handling slippery objects. 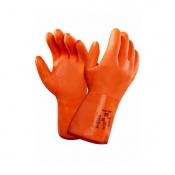 The AlphaTec 58-435 Gloves feature a 16mm nitrile shell that protects against exposure to bases, oils, fuels, some solvents, greases and animal fats. An extra-long cuff, with foldable gutter on the 58-435 Gloves provides further protection by preventing liquids from dripping onto the forearm. The table below shows the test results of the Ansell AlphaTec 58-435 Gloves according to EN 388:2016 Mechanical Risk specifications. 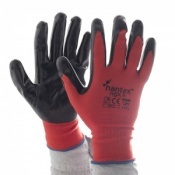 These gloves are available in a range of sizes, making them suitable for most users. Please consult the table below for details, then select the required size from the drop-down menu at the top of the page. The gloves have a length of 380mm.